Want to Pastor a Large Church? The General Assembly of the Orthodox Presbyterian Church has entrusted its denominational magazine, New Horizons, to the Committee on Christian Education for the purpose of informing OPC members and others about OPC ministries and providing instruction on Christian faith and life that is consistent with the doctrinal standards of our church. The Orthodox Presbyterian Church didn't always have a denominational magazine. The OPC was founded in 1936, but New Horizons in the Orthodox Presbyterian Church didn't appear until January 1980. Become the editor of New Horizons in the Orthodox Presbyterian Church? As I reflect upon the privilege I had to labor in that job, that question does come to mind. 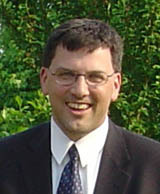 I was sitting in a restaurant in Harare, Zimbabwe, back in 1988, when a member of the Committee on Christian Education (and my colleague on the Committee on Ecumenicity and Interchurch Relations), G. I. Williamson, voiced this query to me: "Tom, would you be interested in serving the church as editor of New Horizons?" Without skipping a beat, I answered him in the negative. 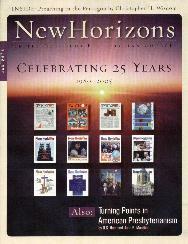 People often asked me how I chose topics for the feature articles when I served as editor of New Horizons from January 2001 to March 2004. There was a method to my madness. The March or April issue focused on Christ's resurrection and related themes, the December issue focused on Christ's incarnation and related themes, and the November issue focused on Worldwide Outreach and the Thank Offering. But what about the other eight issues? Americans, let us admit, have a problem with history. History is bunk, said Henry Ford. A disdain for the past is a long-established feature of the American temperament. Ours is a culture that achieved political independence and evolved into a world power by jettisoning old-world values.